The Old Town of Lijiang represents a fusion of indigenous Naxi architecture and culture with external influences. 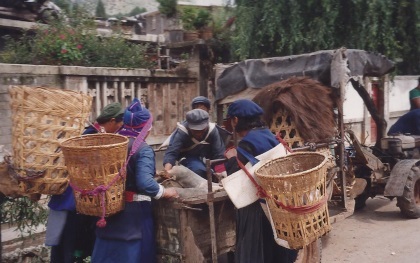 The Naxi-minority descends from Tibetan nomads. They have a matriarchal family tradition and an over 1000 years old script. This script consists of pictograms, and is kept alive by some individuals. There is also a Naxi-orchestra: old men that play traditional Chinese music on antique instruments, unique for China. 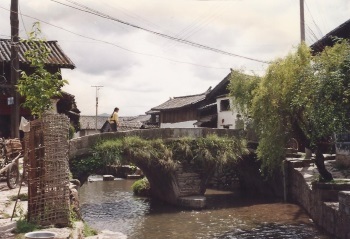 Lijiang has an ingenious ancient network of waterways, that is supplied by the mountain springs. Via canals the houses in town are connected to this network. The cobbled streets, bridges and houses add to the picturesque picture of this ancient town. It gained wide attention in the 1990s: first because of a BBC-documentary and a childrens series, that made kind of a myth out of Lijiang. In 1996, the town was hit by a very serious earthquake which damaged a lot of the old houses and streets. 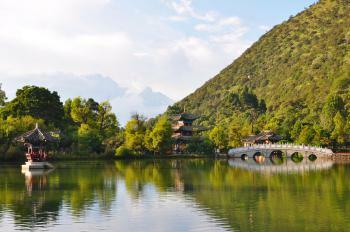 Lijiang is situated in the remarkable Yunnan-province, in the Southwest of China. I went to Lijiang via a very long bustrip through the mountains. Nowadays, there even seems to be an airport. The little city certainly deserves a stay of a few days from tourists that are interested in culture and history. The food also is recommendable: I still remember the baked cheese with sugar (?!!). That is a very quiet city in the west area of China.The average altitude there is above 2000 meters which cause the sky much more clear and the sunshine stronger. While enjoying the amazing scenery there, please don`t forget avoiding yourself get harm from the sunshine. Lijiang, a town in northwestern Yunnan with its beautiful culture of Naxi people, unique old wooden houses along the canals, picturesque gardens and breathtaking surroundings, is truly one of a real gem of this region but also maybe one of the worst examples of tourism industry development in China. Lijiang has two faces, in daytime; the Black Dragon Pool Garden is the place to see, its Five Phoenix Hall in the middle of the pool with the Jade Dragon Mountain as the background, is one of the iconic views of Southern China. While the town is beautiful with Naxi architecture which has some details different from mainstream Chinese and along the street is full of interesting handicraft shops, and don't forget to go to the top of the hill behind the town for absolutely gorgeous view. After sunset, Lijiang is brightly lit with red lanterns and spotlights, and I have to admit that Lijiang by night is very pretty; however, the town is full of clubs and bars with really loud Chinese music and dancers, some show is traditional or modern, but some is quite dirty. Almost everywhere is quite chaotic and packed with diners and fun seekers, the scene that you never expected to see in UNESCO protected zone! In my opinion Lijiang is maybe one of the worst examples of tourism industry development in China, and from my observation, Lijiang by night has more tourists than in the daytime, sadly that they don't come to admire fascinating culture, but for fun in clubs scene. 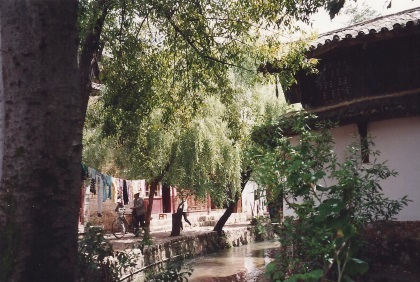 Although the authenticity of Lijiang is maybe lost forever as many parts of the town are already changed, the ancient buildings become souvenir shops, boutique hotels, restaurants, clubs and bars with Naxi cultural show for tourists, the town is still have some place to admire especially in the suburbs of the old town and the Black Dragon Pool Garden where local Naxi are living. All in all, Lijiang is a great place to visit at least to see how China sells minority culture for tourism. We went there for 4 days - and ended-up staying for 2 weeks and that too was not enough. We LOVED IT. At some time in our life - we want to live there for as long as we can. Its beautiful, lovely, friendly and the weather is just perfect (most of the times). One of the best places we have ever visited in all my travels. I have just returned from Lijiang (April 2009) and am still mesmorised. Like one of your other commentators, I could easily live there. No more hectic, crazy modern world. Picturesque, haunting, friendly, warm -- I could go on forever. I shall certainly return. Lijiang has to be one of the nicest small cities in China. It is true that there has been an increase in tourism there, but you can escape from the tourists easily enough by escaping down some of the backstreets (which are more interesting anyway). The architecture of the city is great and the Naxi people carry on with their lives just as they have been for centuries. You should absolutely trek Tiger Leaping Gorge, very near Lijiang. The trek runs through the gorge created by Yulongshueshan (5500+ meters) and offers great views of the Yangtze river at its wildest. It can be tackled by a moderately fit person in two days. In the Fall there is an explosion of spiders along the trail. We had to walk by (and sometimes under!) huge webs with dozens of beautiful orange and green spiders in them, which was a bit unnerving, but wonderful at the same time. I was in Lijiang a few weeks ago. The Old Town square has become quite popular with lots of tourists, shops and restaurants with more Westerners than Chinese. But a few minutes away from the tourist filled spot, and the city is breath-takingly exquisite. Lijiang is very tranquil and a cool oasis away from the mad rush of commercialization and industrialization that is taking place throughout the rest of China. Lijiang is definitely a "must visit" before it gets swallowed by the growing commercialization of China. I have been Lijiang twice, which luring me all the life. I will go there if i have another chance! I went to the Old Town Lijiang in November 2003. It was quite an experience, especially a warm and friendly comfort from local Naxi people. When you see the city in the first minute, the over-crowded tourists might turn you down a little. Once you having stayed long enough, horsed round those cannals and bridges, and tryed Baba cake and local food, you will love this town. I will travel back to Lijiang. The winding cobblestoned streets in the old town are just waiting to be explored. you truly experience the magic at dusk, when the busloads of daytrippers with flag-bearing guides who clog up the narrow pathways during the day depart for their comfortable hotels in the new town. then, it is truly a pleasure to sit and watch the world passing by, next to the gurgling streams and shady walkways. i went there during summer, at the height of tourist season and could not get a single hotel accommodation. then a family asked me if i wanted to stay in their home for the night. it was very spartan, just a room in a noisy household, with the entire family sharing a squat toilet, but that was the place i really remembered from all the places i stayed in yunnan. Role of Women: Mosuo minorities who inhabit Lijiang show clear traces of matriarchy. 144 Community Members have visited.